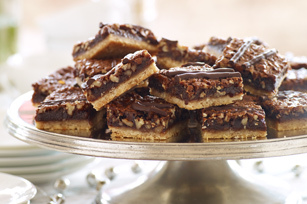 The crust of these bars tastes like a sugar cookie, and the filling tastes like pecan pie (with a touch of chocolate!). But the best part is baking a big batch of our Chocolate-Pecan Bars to share with friends. Beat butter, flour and 1/2 cup sugar with mixer until mixture resembles coarse crumbs. Press onto bottom of 15x10x1-inch pan sprayed with cooking spray. Bake 20 min. or until lightly browned. Meanwhile, chop 6 oz. chocolate; place in medium saucepan. Add corn syrup; cook on low heat 3 to 5 min. or until chocolate is completely melted and mixture is well blended, stirring frequently. Remove from heat. Add remaining sugar, eggs and vanilla; mix well. Stir in nuts. Pour chocolate mixture over warm crust; spread to evenly cover crust. Bake 30 min. or until chocolate topping is firm around the edges but still slightly soft in the centre. Cool completely. Melt remaining chocolate as directed on package; drizzle over dessert. Let stand until chocolate is firm before cutting into bars. Line pan with foil with ends extending over sides; spray with cooking spray, then use as directed. Lift cooled dessert from pan with foil handles before cutting dessert into bars. Not only are the bars easier to cut, but cleanup is also a snap!